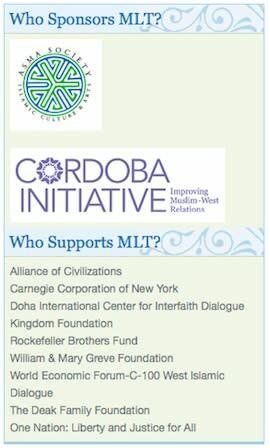 The opponents of the proposed Cordoba Initiative Islamic center planned for Lower Manhattan are fond of suggesting, by way of lengthy and often confusing chains of causation and association, that its principal planner, Imam Feisal Abdul Rauf, is connected to terrorism. "The imam has been tied to some shady characters," Fox Business Channel's Eric Bolling recently said, "so should we worry that terror dollars could be funding the project?" Blogger Pamela Geller, who has become a regular talking head on cable-news channels to denounce the mosque, has noted Rauf's involvement with a Malaysian peace group that funded the group that organized the Gaza flotilla under the headline, "Ground Zero Imam Rauf's 'Charity' Funded Genocide Mission." Indeed, as none other than Rupert Murdoch's New York Post reported last May, the Kingdom Foundation, al-Waleed's personal charity, has donated a total of $305,000 to Muslim Leaders of Tomorrow, a leadership and networking project sponsored jointly by two of Rauf's organizations, the American Society for Muslim Advancement and the Cordoba Initiative. 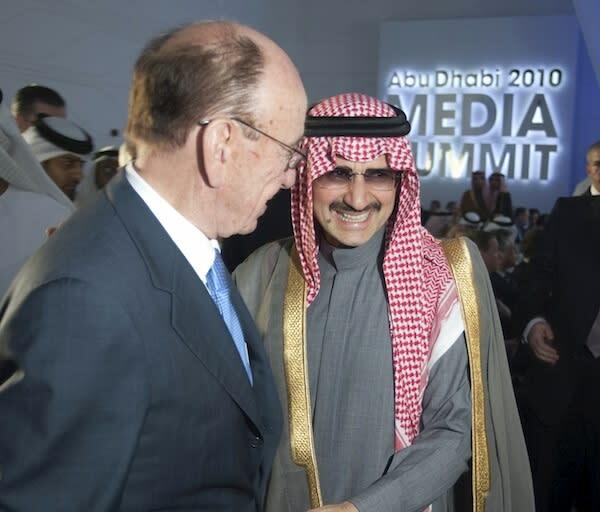 Al-Waleed owns a 7 percent, $2.3 billion stake in News Corporation. Likewise, News Corporation owns a 9 percent, $70 million stake — purchased in February — in Rotana, Al-Waleed's Saudi media conglomerate. Put another way: Rupert Murdoch and Fox News are in business, to the tune of billions of dollars, with one of the "Terror Mosque Imam's" principal patrons. As Geller helpfully notes on her blog, Al-Waleed donated $500,000 to the Council on American-Islamic Relations — which has been repeatedly denounced on Fox News's air by Geller and others as a terror group — in 2002. Indeed, Rauf's "numerous ties to CAIR" alone have been cited by the mosque's opponents as a justification for imputing terrorist sympathies to him, yet few people seem to be asking whether Murdoch's extensive multi-billion business collaboration with the man who funds both Rauf and CAIR merits investigation or concern. Other beneficiaries of Al-Waleed's largess include the Islamic Development Bank, a project designed to "foster the economic development and social progress of [Muslims] in accordance with the principles of Shari'ah." The IDB funds the construction of mosques around the world, and has been implicated by frequent Fox News guest Stephen Schwartz in an attempt to spread radical Wahhabism (a fundamentalist branch of Islam) throughout the United States. Geller has worried in the past on her blog about Al-Waleed's ownership of News Corporation shares, but never on anything like the scale of outrage she's mustered in opposing the mosque. We asked her why Rauf's tenuous connections to radical Islam disturb her so, while Rupert Murdoch's direct ties to a man who funds what Geller regards as terrorism have spurred no such outcry: "I'm not aware that News Corp. has any such close connection with anyone connected with CAIR, and despite the involvement of Al-Waleed bin Talal in News Corp., I don't believe that the two connections are analogous. ... Fox ... has been much more honest and objective about Islamic supremacist initiatives, including this Ground Zero mega-mosque, than have the other networks. Consequently, I would say that while Al-Waleed's stake in News Corp. should indeed be a matter of concern for free Americans, at the same time a matter of much greater concern should be the funding of the other networks, and the possible influence that funding has had upon their unrelenting Leftist and pro-Islamic supremacist bias." Fox News had no comment. An email to Al-Waleed's Kingdom Holdings was not returned.